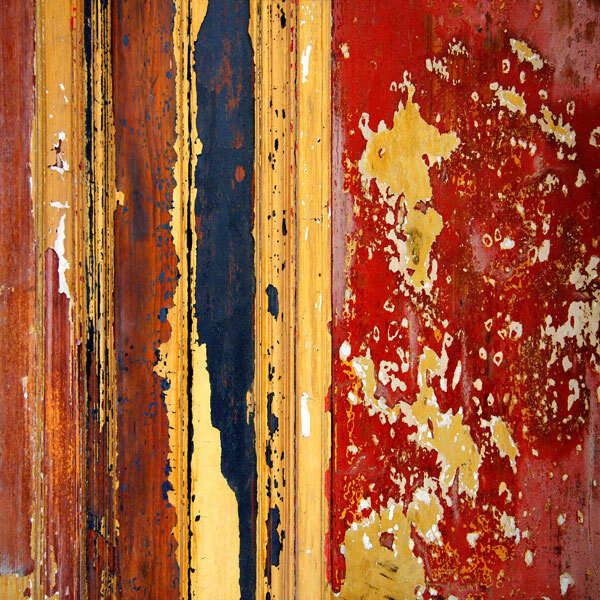 PHOTOGRAPHS & ABSTRACTIONS 2003-15 | I’ve had a lifelong interest in and an intermittent practical involvement in abstract painting. A collection for a 2001 exhibition was based on film photographs of Chicago architecture. Each was titled “Chicago Archistract” (architecture + abstract). Through my first digital camera in 2003 I saw the possibilities for more complex archistract and other unique compositions beyond paint. The first Gallery showing architectural and other abstracts posted in 2007 was revised in 2015/16 as ABSTRACTION 1. 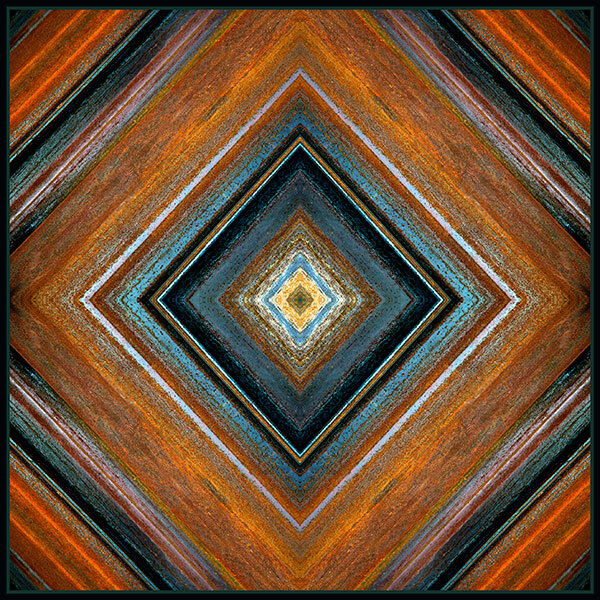 More Abstractions Galleries are online. This gallery contains ‘abstracts’ altered lightly from the original photographs through to others far removed and unidentifiable. Here, the source is a long and high length of a smooth concrete retaining wall on Newcastle quayside capped by a sloping bank of shrubs and small trees. 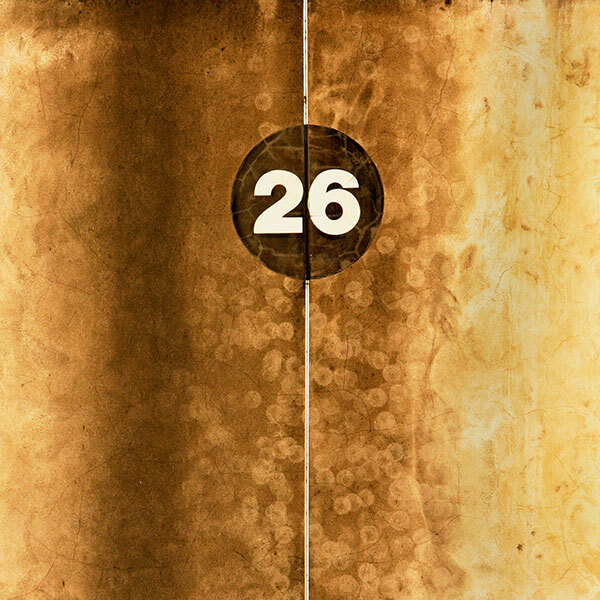 Soil stained water streamed a patina of stains in pale browns with a hint of yellow. The wall was punctuated by a succession of mysterious doorways alternating with number discs. I experimented to enhance the latent yellows in the photograph and increase the contrast range. Twice in the past I’ve tried to complete an image a day for a year, working to a wide variety of weekly themes. They lie on file and I’ve made little use of them other than for reference. 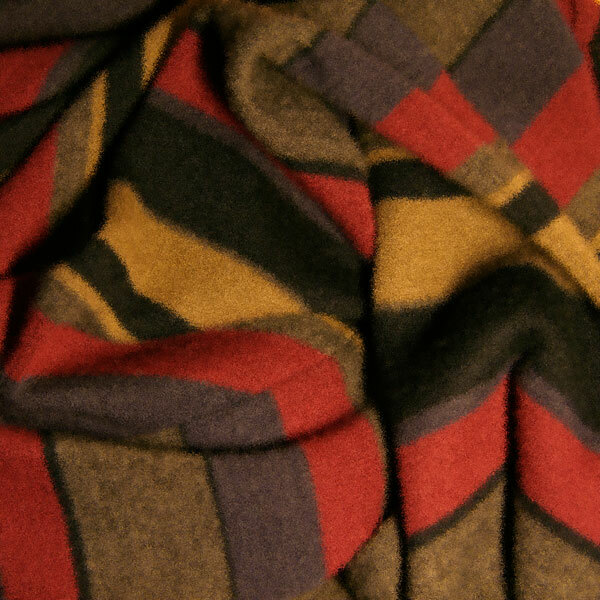 This is one of a set using striped garments in wool and cotton as a subject. It’s a nudge away from the original simply to introduce a softer texture to the surfaces and more sombre colour tones. I liked the way in which lines and shape edges interacted with the flowing undulations of the fabric. 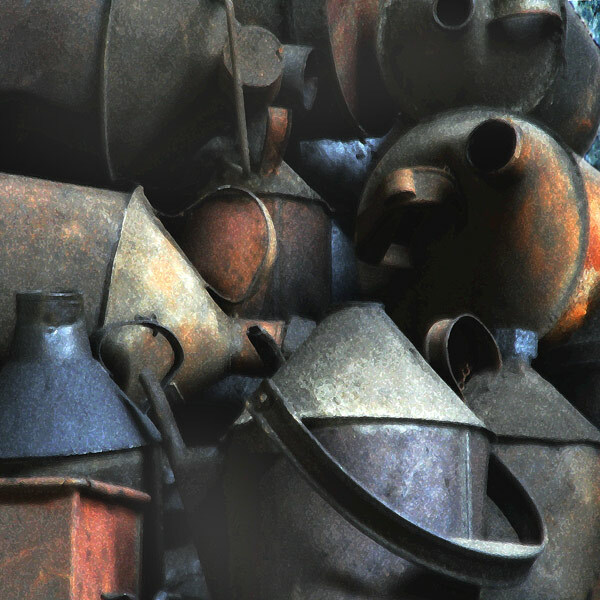 On a visit to a steam railway workshop I saw a collection of oil cans stacked at random some eight feet above in very low light; their surfaces carried a patina of dust, oil and rust. I liked the combination of forms but lack of contrast seemed to be a problem as was a slight lack of sharpness from a hand-held camera. The still-life group itself appealed and I sought to breathe more life into the original image. Experiments with colour adjustments including saturation brought latent surface hues to life and this version emerged as the image of choice. Whilst slowing down for a station stop my Amtrak coach passed alongside a box car in a slow-moving freight train. I managed two hasty exposures when this painted graffiti suddenly materialised. I liked the ambiguity of colours, painting gestures and the identity of the material surface beneath. 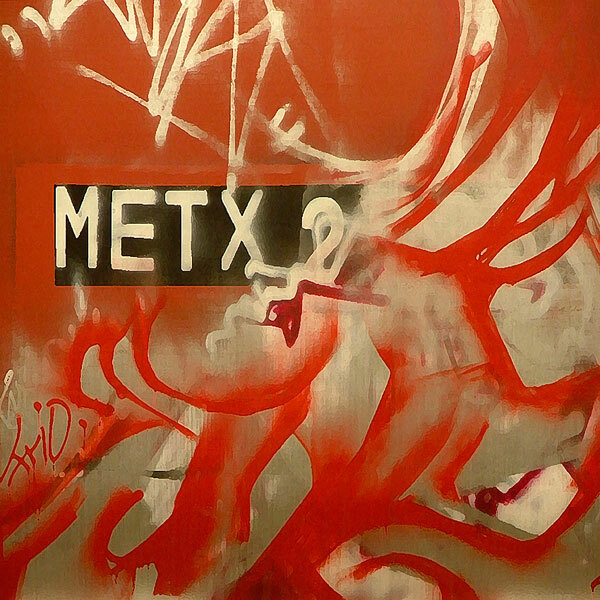 Was METX2 railroad work or that of a guerrilla artist? Is this abstract expressionism in the wild? I sought to slightly enhance both the free painting quality of the work and to a lesser extent the already bold colour saturation. This American locomotive had a complex combination of forms, surface planes, graphics and yellow paint modulated by directional light. I wanted to remove as much of the subject’s three dimensional nature as possible to create an image with width and height but the minimum of suggested depth. The diagonal cruciform layout was important and I emphasised this a little in image development: colour enrichment completed the process. 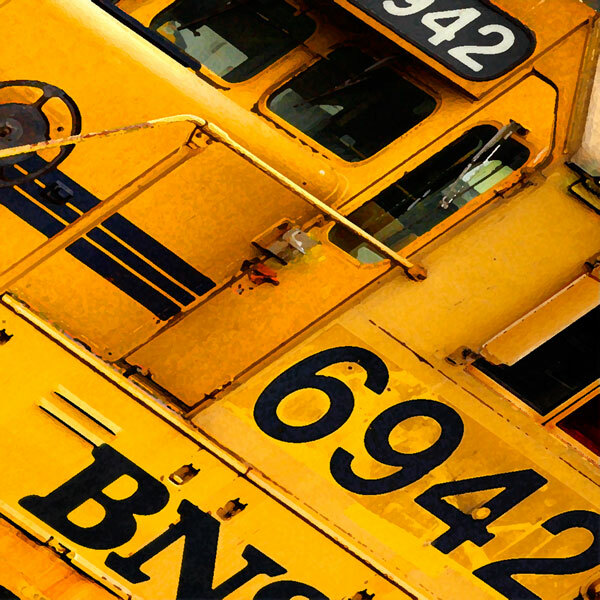 Straight American diesel locomotive photographs are contained in the SEATTLE RAILROAD TRAINS gallery. This is a detail from a steel buffer stop set to prevent train over-runs at the end of a length of railway track. This incorporated steel sheet and track rails bolted and welded together. Framed to isolate a particular combination of geometric shapes I enhanced the mottled colours and surfaces of the rusting metal. 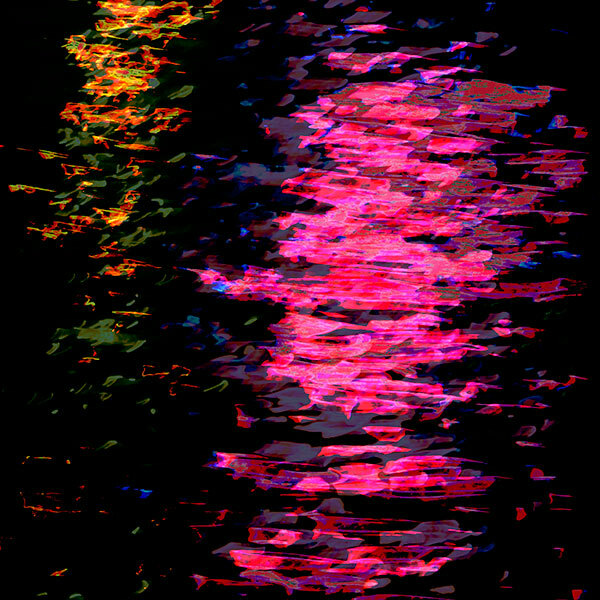 A distinctly painterly quality emerged as I experimented across several versions. Docking after a night ferry voyage between Bainbridge Island and Seattle I caught a fragment of water surface reflecting lights on the dockside and in the high buildings beyond. 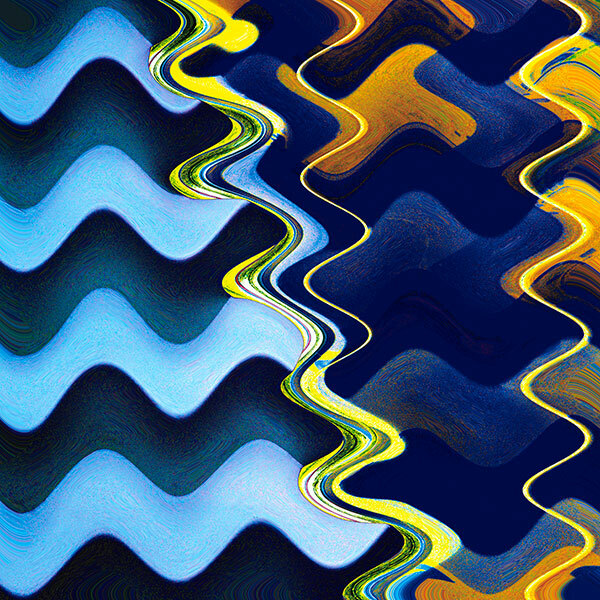 I hardened the rippled shapes to introduce some angularity before enhancing the colours. With hindsight, I wish I’d taken more photographs to allow for wider experimentation. Brushed text been applied in greens to a large sheets of paper pasted to the exterior wall of a former art gallery. I photographed quite small areas as part of a lettering theme but without thoughts of future abstractions like this. 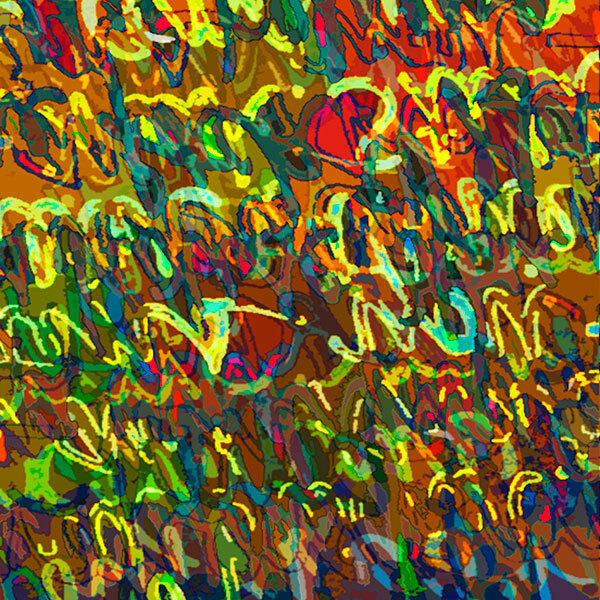 It’s one of a subsequent series seeking illegibility by colour change, inversion, reversal and layering. It perhaps equates with the loss of spoken word intelligibility in the conversational hubbub of a crowded space. Rolls of heavy wire netting perhaps four feet high with a mesh size of some four inches waited to be unfurled for stapling to timber fence posts. 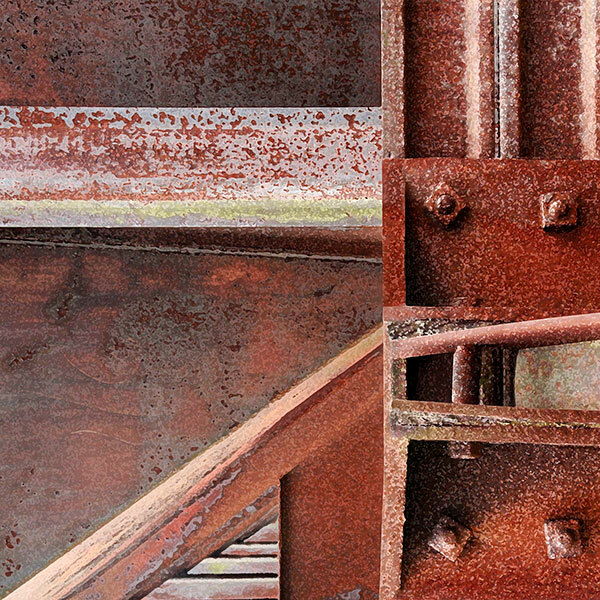 Stored outdoors, the blue-grey zinc plated steel carried white dust created by weathering, contrasting with the reds of iron rust breaking through the coating. 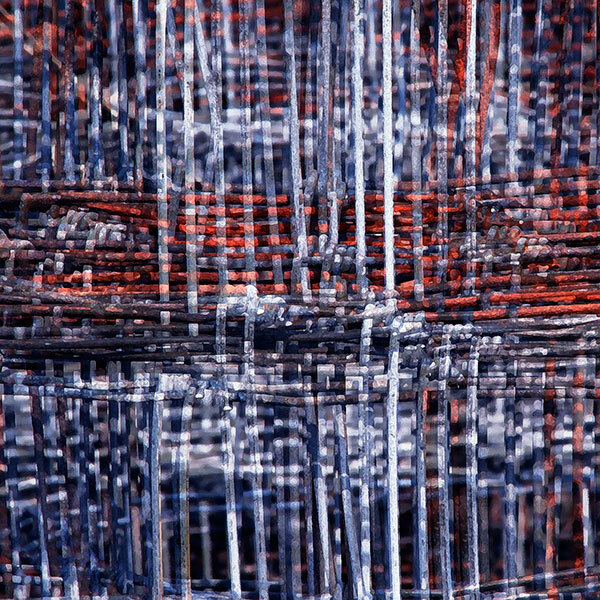 The depth contained within the netting spiral was enhanced by computer layering whilst texture and colour were strengthened: the original subject is difficult to identify. The dense cruciform structure hints at architecture. I rescued some striped wrapping paper offcuts simply because I liked its simple pattern and colour range before I thought of it as a photography subject. I folded diagonal pleats into a piece to use as a starting point in exploring its imagery potential in a square crop. This reversed layering was the simplest first step that added a new sense of three-dimensions and pointed the way forward. 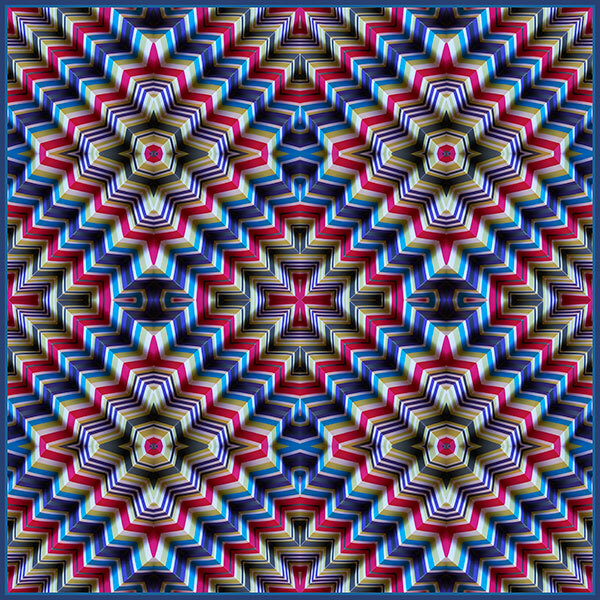 A four-way inversion and reversal of the original image created this symmetrical composition. Strengthening the colours further enhanced its three-dimensional qualities. 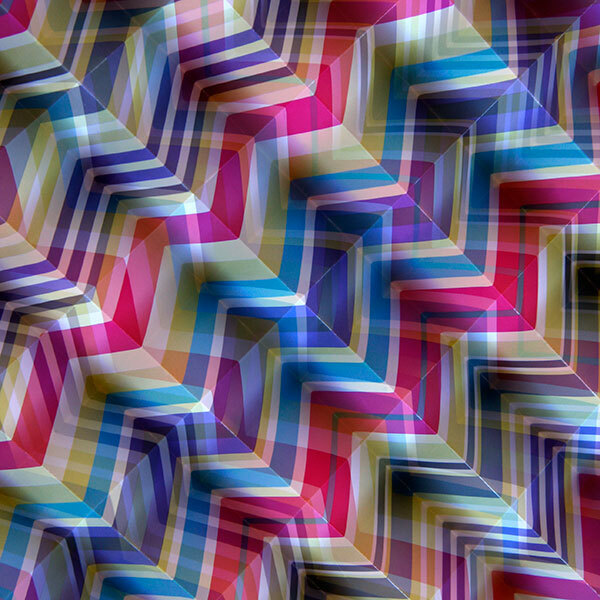 It’s now an image of a paper-folding impossibility created digitally. Combining four images seemed an inevitable move but I have yet to further increase the multiplicity. 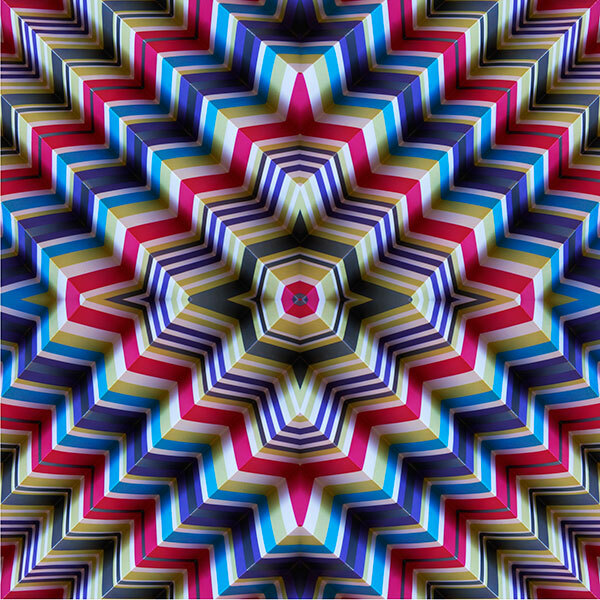 I recall seeing exhibitions of Op-Art era paintings by Bridget Riley and others flourishing in the 1960s. Digital imagery would perhaps have offered great support to its pioneer painters and printmakers. I’d already tried adding a narrow double frame to other abstractions and one seemed appropriate to this image. Further repetition to an architectural scale could create a visually unsettling environment. Sidewalks on some Chicago River bridges are constructed from small square gridded steel panels filled with a fine stone chip mortar mix. When new it’s as smooth as one would expect but here it’s worn and weathered to expose cement that’s been stained by iron rust, all framed by metal matt polished by walkers’ feet. The original photograph is posted in the CHICAGO FRAGMENTS gallery. 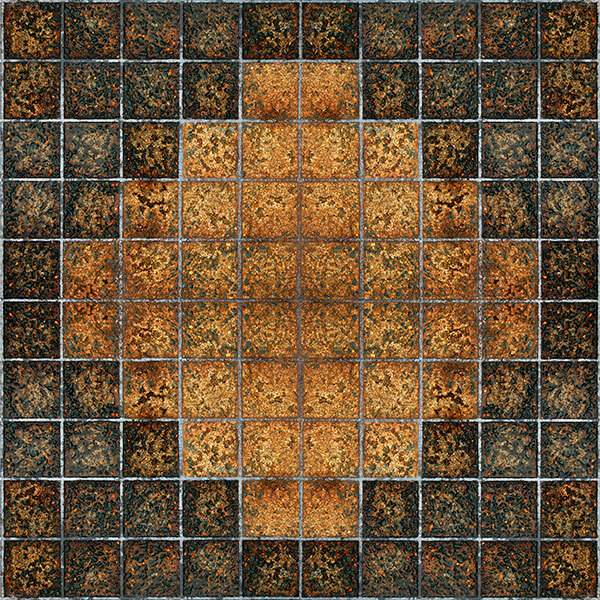 I chose that particular paving section because of the colour change cutting diagonally through the grid. This cruciform image was assembled from one crop rotated and reversed: the colours are untouched. Storm Desmond in December 2015 caused extensive flooding in the UK. Earlier flooding on my local river required repairs and strengthening work to existing dykes completed late in 2014. In 2015 they proved inadequate in the face of the highest river levels said to have been recorded since 1771. Part of the works included the driving of a long stretch of interlocking steel piles into a sandy river bank. I took photographs of small areas from the metal: some were angled at some 45 degrees to enable the assembly of 4 X 1 cruciform images. Colour saturation concentrated the existing rust reds and steel blues on the surface of the metal. The ARCHITECTURE ABSTRACTS ARCHISTRACTS Gallery contains images created from photographs of Seattle Central Library. This is housed in a building of dramatic forms and spaces offering a stimulating internal environment for exploration, reading and contemplation. I recall a set of in-line escalators giving unbroken access to all floors. They were finished in a sharp yellow with black trim: fragments were recorded. This image retains little of the actual colour in this transition to predominant blues whilst the shapes within would be difficult to interpret as a staircase. This is one of several developments where colour variations became more complex and increasingly distanced from the simple original photograph. 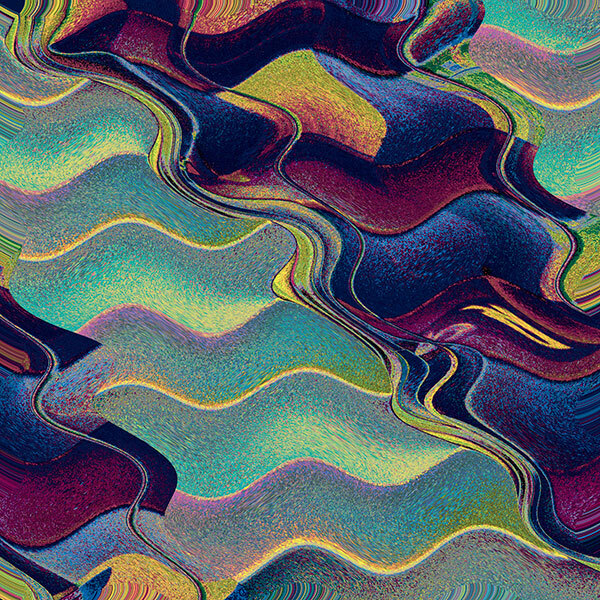 I liked the particle flow patterns emerging within the wave forms evolved from staircase steps. Perhaps the images suggest movement but that was not a particular intention. I find architectural abstractions fascinating, whether simply by concentration on framing through the camera viewfinder, square crops or in the free flowing serendipity of this approach to image creation. Subsequent shape and colour shifts included this textured variation. 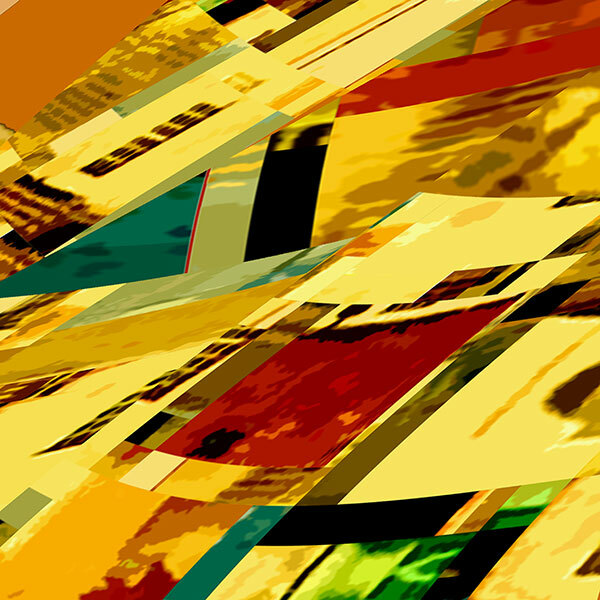 Two of the first explorations are posted in the ARCHITECTURE ABSTRACTS ARCHISTRACTS gallery. This is a composition that in 2004 I thought to enlarge as a painting which was never begun. After a long break I’ve returned to this abstraction approach, particularly in archistracts created from architectural photographs. More will eventually be posted online.